Here is my 3D project for the challenge over at Decorate to Celebrate. 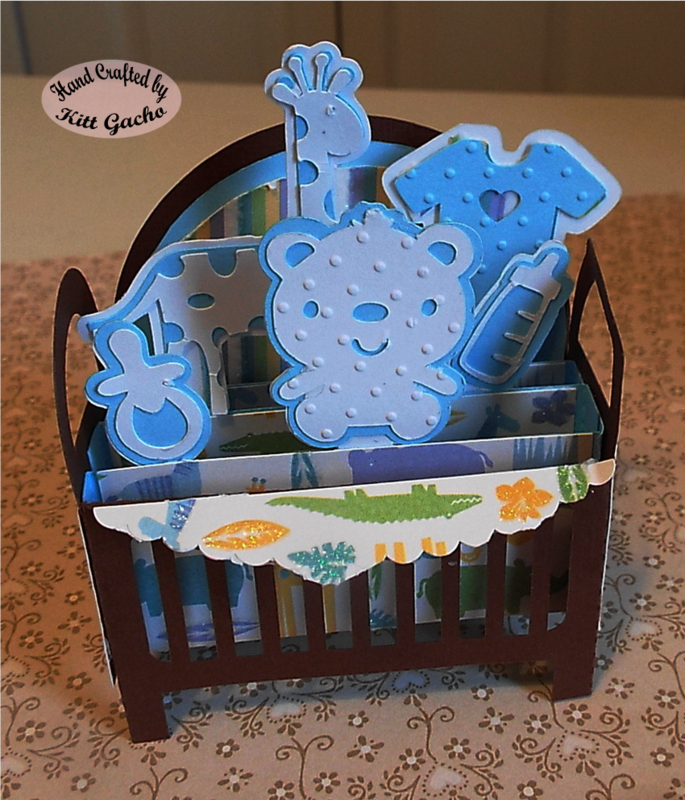 It so happens I had to make 2 of these cute crib box cards this week and yes they are boys. This folds flat for mailing. The pattern is from Casual Whimsy on Etsy. Be sure to stop by and see what the talented DT has for your 3D inspiration and join in the fun. 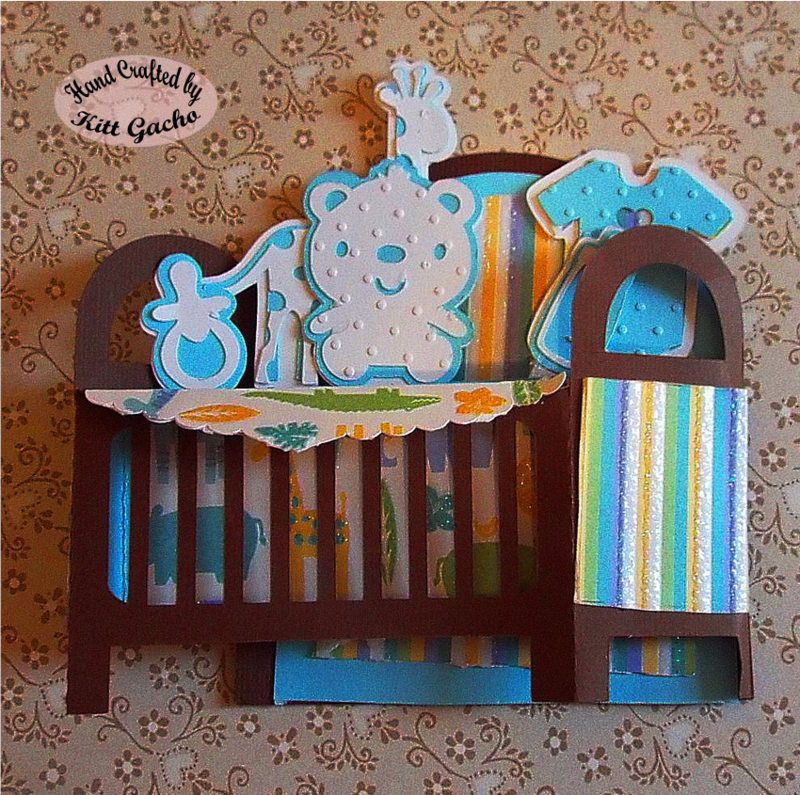 I used the Silhouette Cameo to cut and Cricut Swiss Dots embossing folder to embellish the bear and onesie. Thanks for stopping by and leaving your comments. I love hearing from you. Have a happy crafty day. 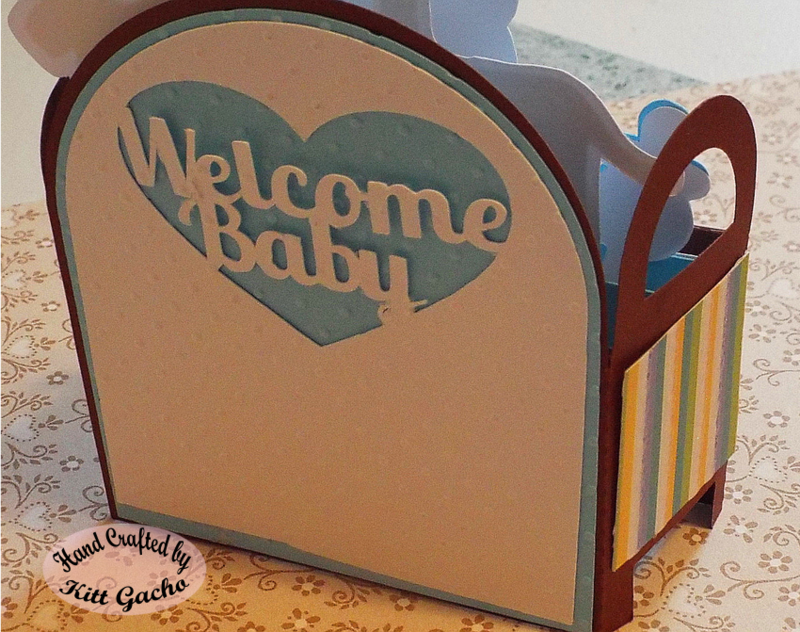 Wow, how cool is this baby welcome gift! The details and design are super awesome! Thanks so much for playing Simon Says Stamp Wednesday “Anything Goes” Challenge! Your crib card is so adorable! I love that it folds so you can mail it! Kitt, this is the cutest pop up card I've ever seen. Great job, and thanks SO MUCH for sharing it in our challenge. This is so cute! Love the pop up! Fabulous job! Oh wow, this is brilliant ! What an amazing design !Thank you for joining us at Simon Says Stamp Wednesday Challenge. The crib is very creative! Thanks for playing with us this week at 7 Kids Collage Fund. This is adorable!!! Thank you for sharing. Adorable project! Thank you for sharing with us at Ruby's Rainbow Challenge. what a beautiful idea! Love this! Thanks for playing at Kraftin' Kimmie Stamps. We have challenges every Wednesday (anything goes) & Saturday (follow the theme), you can use any stamp you want...so come join the fun and win gift vouchers!